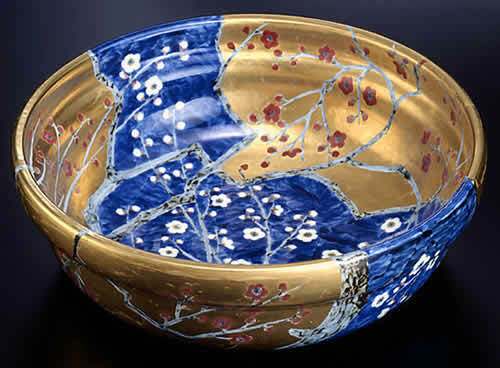 Bowl with design of Japanese apricot blossoms painted in the underglaze and the gold. Covered box with flowing water design painted in the underglaze　blue and red, and the silver and the gold. Stem cup and Cup and saucer with design of scrolls painted in the underglaze. Sake cups and bottle with flower design painted in the underglaze. Pilgrim bottle with flower design painted in the underglaze.On the left Pilgrim bottle with flower design painted in the underglaze. Bowl with crooked rim with flowing water design painted in the underglaze and the silver. Cup with the design of grape vine painted in the underglaze. Pilgrim bottle with the design of grape vine painted in the underglaze. Hexagonal cup with stem with the design of a stream painted in the underglaze blue. Bowl with crooked rim with the design of a stream painted in the underglaze blue. Covered box with design of ripples painted in the underglaze blue and red, and the silver. Pilgrim bottle with design of peacocks and peonies painted in the underglaze blue.